In game theory, zero-sum describes a game where one player’s gain is a loss to other players. A logical fallacy often occurs when this idea is applied to political and social justice discussions. The resulting conclusion of this zero-sum fallacy is that ALL resources are fixed and limited, therefore, one person’s gain is always another person’s loss. Justice, however, is not a limited or fixed resource. While we live in a society where people recite a pledge of allegiance that asserts, “One nation under God with liberty and justice for all,” when the absence of justice for a particular group of people is illustrated and protested, often the response is to suggest that demands for justice for that particular group of people is somehow a loss of justice for other people. While the response, “All Lives Matter,” might seem to suggest a concern for the well-being of “ALL” people, the fact that the slogan was a direct response to the phrase “Black Lives Matter” rather than a direct response to the violence and injustice perpetrated against unarmed black men, women, and children, suggests that the phrase is NOT an attempt to affirm the value of all lives. Instead, the phrase, “All Lives Matter,” actually illustrates a belief in the zero-sum fallacy. An underlying premise of the opposition to the Black Lives Matter movement is the unfounded belief that advocating for justice on behalf of black people somehow negates or diminishes the availability of justice for all other people. Workers refused to return to work, and hundreds of striking workers carried signs that read, “I Am a Man,” as thousands of bayonet-wielding National Guard troops and armored vehicles lined the streets. The Memphis sanitation workers strike was Martin Luther King’s last fight for economic justice. The night before he was assassinated, King delivered a speech that still speaks to the injustices plaguing America fifty years later. The world is all messed up. The nation is sick. Trouble is in the land; confusion all around…. But I know, somehow, that only when it is dark enough can you see the stars…. Something is happening in our world. The masses of people are rising up. Recently masses of young people across America have been rising up declaring “enough is enough” with regards to mass shootings in America. While young people are demanding justice and marching for their lives, others are attacking them and claiming that their demand for justice is a denial of justice for gun owners. Justice regarding guns, however, is not a zero-sum game. Common sense gun laws can protect an American citizen’s right to own a gun while also protecting Americans from near epidemic gun violence. Despite resistance to the passage of new gun legislation, we have to see this struggle through. Let us rise up tonight with a greater readiness. Let us stand with a greater determination. And let us move on in these powerful days, these days of challenge to make America what it ought to be. We have an opportunity to make America a better nation. While I don’t know about “Making America Great Again,” I do know we can make America a better nation. America will be a far better nation when we realize that justice is not a zero-sum game. Justice is for everyone. Working to ensure justice for a specific group of people does not diminish the availability of justice for others. The world needs MORE justice not less justice. Those who assume the fight for justice for black people is a diminishment of justice for all other people fail to understand the interrelatedness of life. Those who assume a fight for justice for Muslims is a diminishment of justice for Christians fail to understand the interrelatedness of life. Those who assume a fight for justice for transgendered people is a diminishment of justice for cisgendered people fail to understand the interrelatedness of life. Those who assume a fight for justice for the victims of gun violence is a diminishment of justice for gun owners fail to understand the interrelatedness of life. “Moreover, I am cognizant of the interrelatedness of all communities and states. I cannot sit idly by in Atlanta and not be concerned about what happens in Birmingham. Injustice anywhere is a threat to justice everywhere. 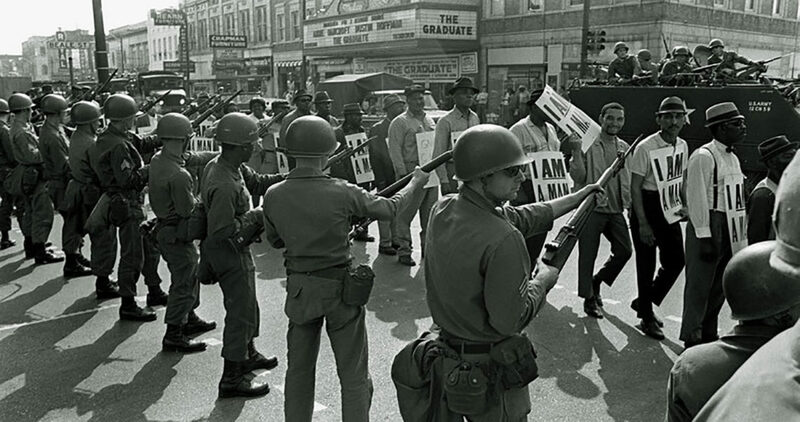 While I join America’s young people in their demand for justice and common sense gun laws, I also remind Americans that fifty years after the Memphis sanitation workers strike, justice for sanitation workers is also STILL needed. Please read every article in the series before participating in the forum discussion. Demanding “justice” for one population means denying “justice” for other populations.